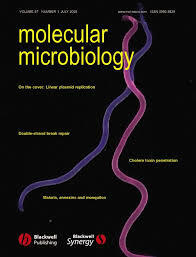 The following article from Molecular Microbiology (2012) 86(3), 557–567, ‘Dynamic complex formation between HD-GYP, GGDEF and PilZ domain proteins regulates motility in Xanthomonas campestris’ by Robert P. Ryan, Yvonne McCarthy, Patrick A. Kiely, Rosemary O’Connor, Chuck S. Farah, Judith P. Armitage and J. Maxwell Dow published online in Wiley Online Library (wileyonlinelibrary.com), has been retracted by agreement between the authors, the journal Editor-in-Chief, John D Helmann, and John Wiley & Sons Ltd. Since publication of the above article, it has been brought to our attention that there are several image duplications across Figures 3, 5 and 6 including duplication with another article in PNAS: ‘Cell–cell signal-dependent dynamic interactions between HD-GYP and GGDEF domain proteins mediate virulence in Xanthomonas campestris’, by Robert P. Ryan, Yvonne McCarthy, Maxuel Andrade, Chuck S. Farah, Judith P. Armitage, and J. Maxwell Dow; PNAS (2010) 107(13), 5989-5994. The authors apologise for the errors that arose due to poor labelling of the electronic images used in the construction of the figures and for not spotting the duplication during review, and, with agreement of all parties, the decision has been made to retract this article. We apologise for any inconvenience the publication of this work may have caused our readers. “Dynamic complex formation between HD-GYP, GGDEF and PilZ domain proteins regulates motility in Xanthomonas campestris” has been cited 27 times since it was published in 2012, according to Clarivate Analytics’ Web of Science, formerly part of Thomson Reuters. I believe the retraction statement and the posts on pubpeer explain everything. I did write to the journal to highlight the errors before they appeared on pubpeer. All the original data was supplied to the journal to show it was a labeling issue of the images. Given there were errors in three figures the authors wished to retract and republish the article rather than correct it. We asked the journals advice before carrying out this action. The authors note that Fig. 2 appeared incorrectly. The corrected figure and its legend appear below. This error does not affect the conclusions of the article. “Cell–cell signal-dependent dynamic interactions between HD-GYP and GGDEF domain proteins mediate virulence in Xanthomonas campestris” has been cited 84 times since it appeared in 2010. We’ve also found a mention on PubPeer by an author on one of Ryan’s papers, saying they have contacted the journal in question to address readers’ concerns. Ryan’s made a name for himself by working on infections that can be deadly for patients with lung diseases such as cystic fibrosis. Six of his papers have been cited at least 100 times. Last year, Ryan was suspended from Dundee during the investigation; he resigned after the university upheld the findings of the investigation, despite his appeal. In 2015, Ryan was selected to be an EMBO Young Investigator; in November 2016, EMBO announced that it had withdrawn him from the program. According to newspaper reports, the University of Dundee has notified affected journals, but without a public report of their investigation readers are left in the dark about how many articles are affected and whether the university has examined all of Ryan’s output, or just some of it. As Leonid Schneider has noted (see https://forbetterscience.com/2016/08/31/the-mysterious-public-career-execution-of-robert-ryan/) most of the details of this case seem to have come from leaks. Surely it would be better (for readers and co-authors) if there was more transparency on this?